Iron Man may be one of the workers assembling the next military plane. Lockheed Martin (LMT) has developed Fortis, an exoskeleton that can shoulder the first 36 pounds of whatever its user is holding. The company is beginning to test the technology in factories around the country, starting with the C-130 plant in Marietta, Ga. Putting on Fortis looks a bit like attaching robot parts to your own appendages, with metal rods and braces outlining the body of the suit. While wearing it, a large tool feels light enough to swing around. A 30-plus pound riveter felt "pretty much weightless" to Jim Medley, an assembly line worker at the cargo plane factory. He was more graceful with his tools than on his feet, however: walking in Fortis is closer to a waddle. Still, Medley found that the equipment substantially lightened his load while drilling and riveting a section of a C-130J wing. The benefit of this newfound strength (aside from feeling like a superhero) is that it enables workers to go for long periods without needing a break. The suit minimizes muscle fatigue, which increases productivity. "It's actually holding the weight ... I just have to balance it and maneuver it to where it needs to go, " Medley said. Fortis works by transferring weight from the arm of the exoskeleton through a series of joints and ultimately to the ground. It has counterweights on the back so users don't fall over. The technology was under development for six years. Lockheed has developed four units so far, with more on the way. Two were sent to the Navy in mid-October for testing and evaluation at their shipyards. 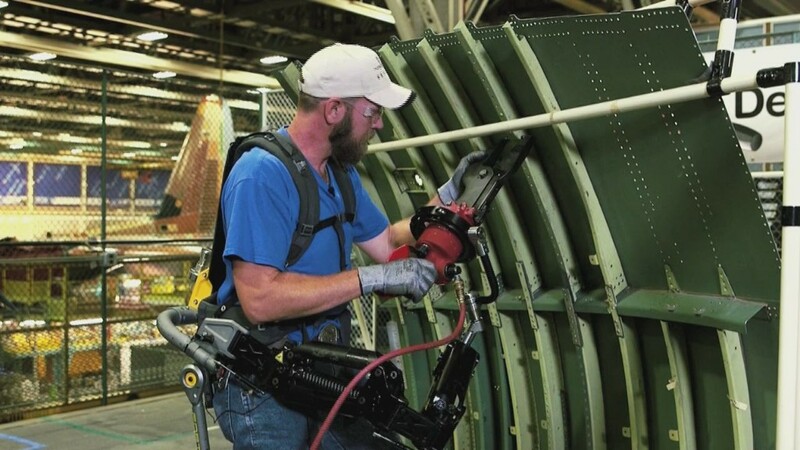 "Workers there were experiencing fatigue from holding grinders up on the sides of ships for long periods of time," Lockheed's exoskeleton technology manager Patricia Aelker said. The other two are traveling to Lockheed facilities around the country as the company tests different applications. At the C-130 plant, Fortis was put to work for riveting, grinding and overhead drilling. "Iron Man is a fictional character that breaks the laws of physics, but Fortis is a real product for real people," Aelker said.